Grizzly bears like people have a comfort zone and if you move into that zone they let you know. First you get the “look” which may be followed with what appears to be a yawn. If you do not withdraw you might hear a clicking of teeth. 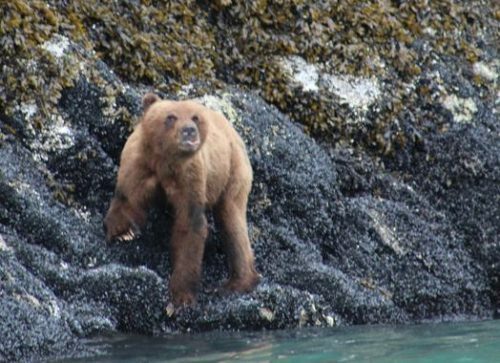 As guides we have the “Leave them the way you find them rule.” We want to be able to return day after day to view bears and having them leave the beach is not good. 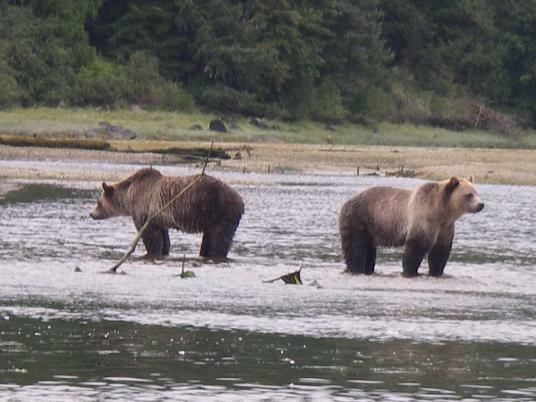 Also along the shore are two more sub-adult grizzlies siblings. These siblings will stay together for four or five years. If one is female they will separate when she first comes into season. 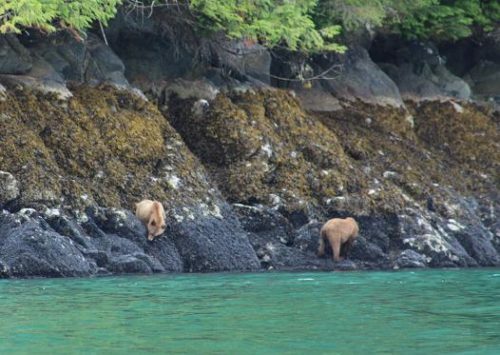 This two bears are working on another source of protein – mussels. 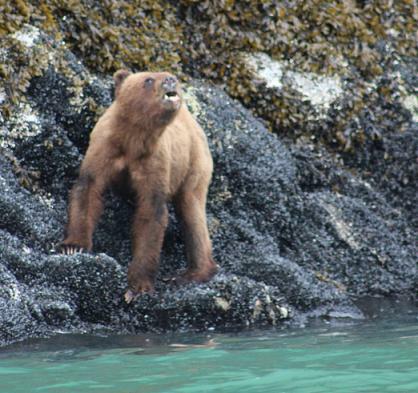 As the photo shows the grizzlies use their claws to scarp the mussels off the rocks and eat them with the shells. When the tide is higher they have to be content grazing on the sedge grass. Grizzly bear cubs are much more curious than their mothers. This cub has noticed our boat even though we try to be quite the boat is made of aluminium and can be noisy. Mother is food orientated and has been in the estuary a number of years to know we are not a threat. Her and the cubs only threat is the male grizzlies and they come from the tree line and not the water. The advantage of the spring tours are the first year cubs. 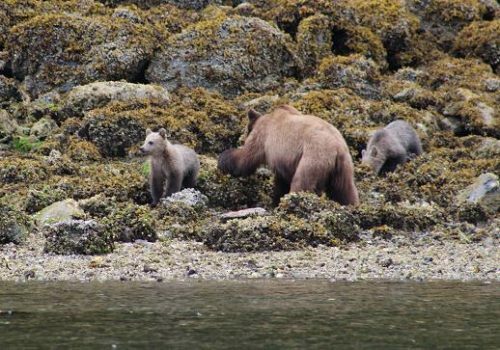 Grizzly bear cubs are born in the den in January or February so these cubs on the beach are five months old. They change quickly from he cuddly “teddy bears” to miniatures of their mother. Although still nursing they are also eating solid foods and rely on their mother to turn over he larger rocks. Arrival at the lodge: First is the assignment of room. Second snacks on the front deck made up of cheese and crackers; fresh prawns or dungeness crab; and drinks: coffee, tea, water or pop. While this is being consumed Angus will give a talk about the lodge and explain your itinerary. Third you are fitted with floater suites / survival suites which are designed to keep you warm and dry but hopefully never needed to keep you afloat. The boys in the boat are wearing these suites on the first evening black bear tour. This orientation trip to look for black bears, seals, bald eagles etc. depends on the tide. 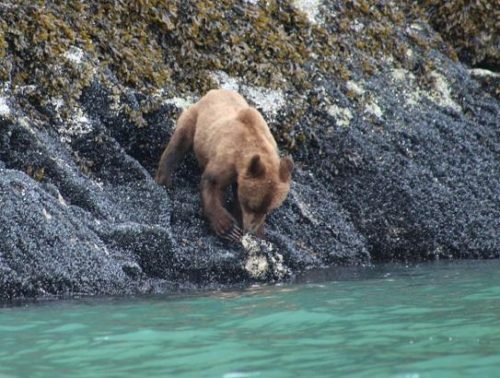 To find bears on the beach we need a beach thus the low tide requirement and because of this the trip may be before or after dinner. 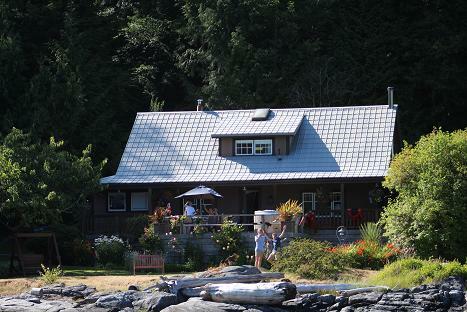 The boats are limited to four guests so this is a more personal tour than other lodges provide. Also there are normally on eight guest in the lodge. 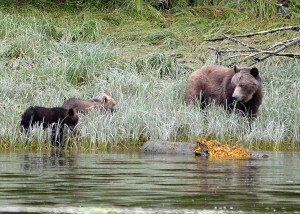 Peder, Ann and family arrived at Grizzly Bear Lodge in July for three nights. This meant a day with the grizzly bears, a day whale watching and the third day with Trapper Rick on a unique wild river, the Kakweikan. All the photos for the next twenty days of blogging were provided by David. The blog content is my creation and will hopefully tell the story of a good time had by all. First is how do they provide a photo of a plane landing on the day they arrived if they were on the plane. Obviously they were not on this plane because we frequently have two planes arriving minutes apart. 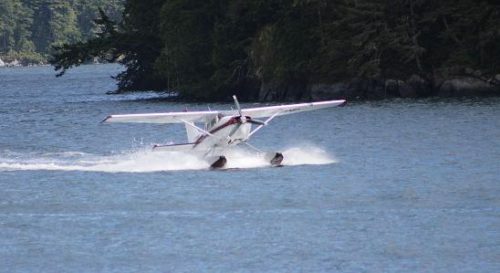 The planes leave from Campbell River for the forty-five minute flight to Grizzly Bear Lodge. 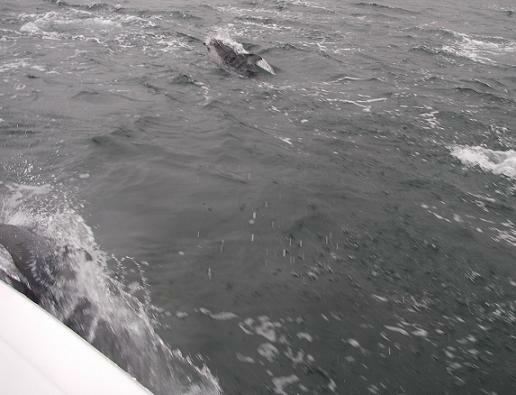 As a guide my favourite activity is to be with a pod of pacific white-sided dolphins while on tours. These dolphins are often in association with another species. 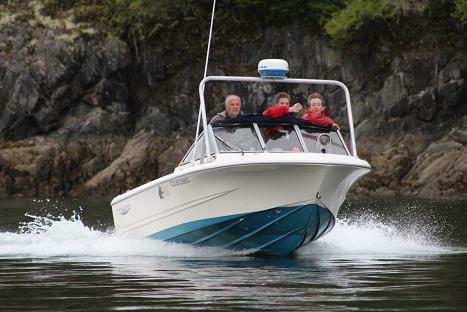 In British Columbia’s inshore waters they are seen with resident killer whales, Steller sea lions, Dall’s porpoise and humpback whales. Dolphins love to play as you will notice in the above photo the churned water and what looks like rain is just dolphins at play. After spending time with dolphins it is not uncommon to have guest say “that made the day”. This is a great site to visit to get a “guest eye view” of a trip to our lodge. Be sure that you do the whole five days that Rob has set up for his trip. 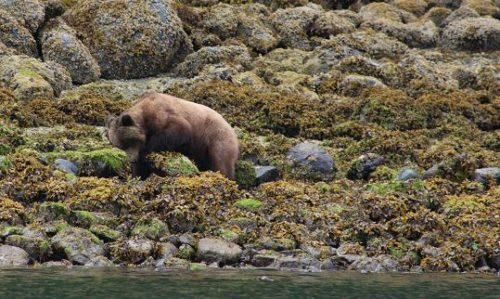 When the tide is lower and the grizzly bears move out into the shallow river to look for salmon the grizzly bear watching tour gets much better. It is hard to catch salmon in a wide shallow river but it makes for good watching as they stand to observe and then run about trying to catch salmon. 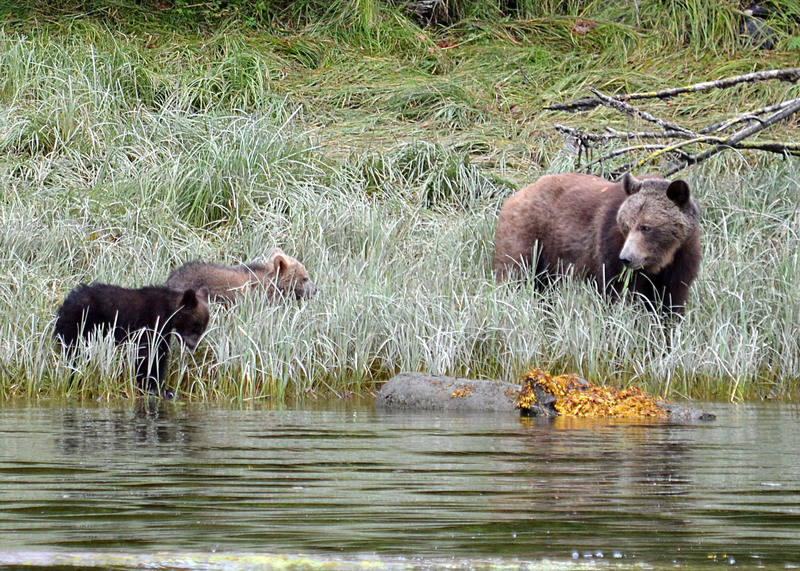 Spring and early summer grizzly bear viewing from the lodge occurs along the shore of Knight Inlet’s Glendale River estuary. 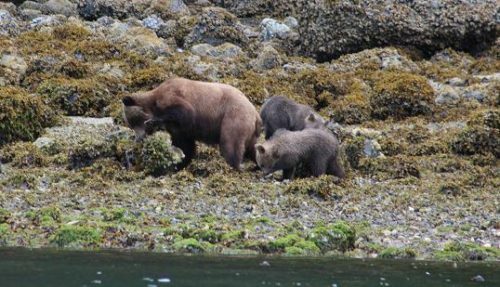 The mother grizzly bears bring their cubs to this area to feed on the sedge grass and roll the beach rocks to grab any available protein. This inter-tidal zone “food” is high in protein and is made up of crab, clams, barnacles, amphipods and other tiny invertebrates. These are July cubs under the watchful eye of their mother.